From Diatribe: Dexcom News and Pipeline! Dexcom announced FDA approval of the new G4 Platinum Share CGM receiver. The new device will be identical to the previous receiver, except that it will include built-in Bluetooth to enable wireless communication with the Dexcom Share app on a nearby iPhone/iPod touch. Previously, the Dexcom Share system required a docking cradle to transmit CGM data to the nearby iPhone/iPod touch, where it could then be sent to up to five followers. This newly approved receiver entirely eliminates the need for the docking cradle and makes the Share system much more portable – a big improvement for caregivers desiring more convenient remote access to patients’ CGM data. As we noted in our Dexcom Share test drive, patients can also “follow themselves” – this means any patient with a G4 Platinum Share receiver will be able to see their CGM data displayed on their own iPhone/iPod touch, no docking station needed. Dexcom also has plans to release more CGM viewing apps in the near-term future, including Android and smartwatch compatible versions. 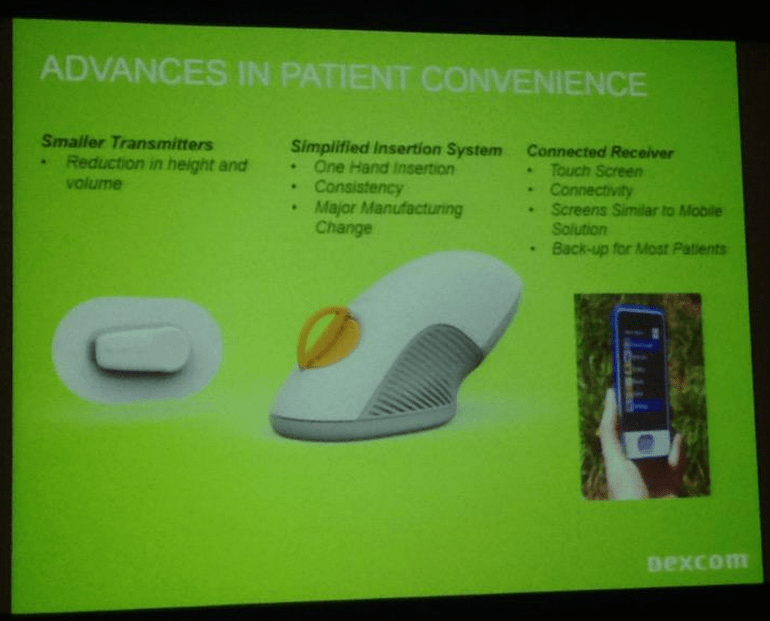 Dexcom will begin shipping the new Bluetooth-enabled receiver in early March 2015, and all patients will receive this one moving forward. Dexcom will offer free upgrades to the new receiver for those who have purchased the $299 Share docking cradle, as well as anyone purchasing a receiver in the first three months of this year (before the updated model ships). The Dexcom Share and Follower apps will remain free on the App store. Customers with in-warranty Dexcom receivers will be able to upgrade to the Share receiver at a low-cost cash price (not disclosed). Notably, the new receiver will also be compatible with Dexcom’s upcoming Gen 5 Bluetooth transmitter and iPhone mobile app. As a reminder, the Gen 5 system will allow CGM data to go straight from the on-body transmitter to an iPhone app – entirely eliminating the need for a receiver for anyone with an iPhone! The G4 Platinum Share receiver would then serve as a backup display for those using the Dexcom mobile app, and as a primary display for those who don’t have an iPhone (until an Android version of Gen 5 is released). Dexcom’s Gen 5 system is slated for an FDA submission by March, meaning approval could come late this year or sometime in 2016 (it’s hard to predict how long the FDA will take to review it). Dexcom also announced several pipeline updates for its future CGM products at the JP Morgan Healthcare Conference (a financial conference where thousands of people working in life sciences descend on San Francisco) earlier this month. We got a first-look at what the Gen 5 iPhone app will look like (please see photo above). The screenshot shows the current CGM value (e.g. 269 mg/dl) prominently displayed above the glucose level trend graph, with an up-arrow wrapped around it to indicate a rising glucose level (a down-arrow would correspondingly represent a falling glucose level). The screen also prominently uses yellow to indicate hyperglycemia, a nice visual indication of time-in-zone (we assume red will indicate hypoglycemia). The Gen 5 system will maintain the remote monitoring capabilities of Dexcom Share, meaning users can still have followers (friends, family, etc.) 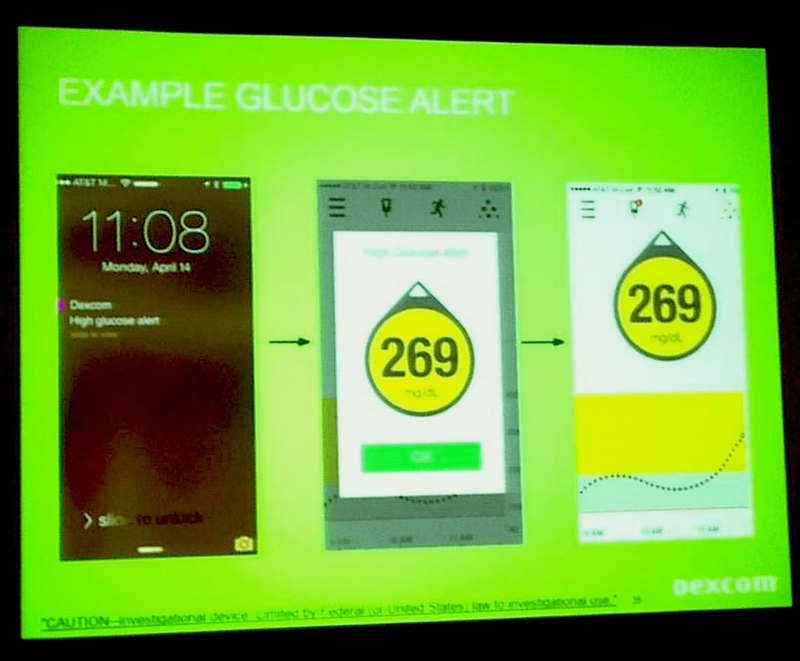 that receive alerts and notifications of their glucose data. A new CGM receiver with a touchscreen design is also in the works. It will have a user interface similar to that of the Gen 5 mobile system. It is not clear to us when this might launch, but it looks like a great update from the existing G4 Platinum receiver. Dexcom has also designed a new simplified sensor insertion system. The advantages are two-fold: (i) it can be used with one hand; and (ii) more consistent insertions – hopefully improving sensor accuracy and reliability. There is no timeline yet for the development and potential launch of this sensor insertion system.